I have not blogged much about my favorite applications for iphone, but I have to give a shout out to the Amazon Kindle application. I held out for a long time, but I wanted to have something I could read in bed while The Boy slept next to me when I didn't want to get out of bed after snuggling with him while he went to sleep. Plus, I like to read, and I have been missing the opportunity to read at the drop of a hat. 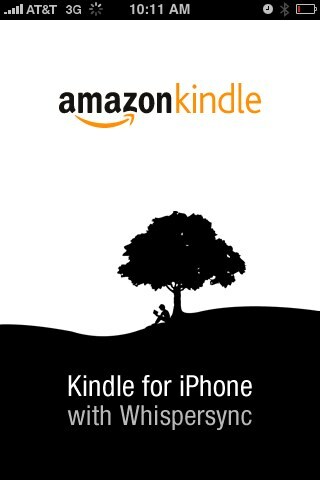 My husband had been using a Kindle for six months or so, and he liked it, so I decided to try out the application on my iphone. Quite honestly, I love it. I love being able to read in line, during lunch, in bed...everywhere! I tend to use the black background, because it is easier on my eyes (dark room, bright light), but I have not noticed any fatigue in my eyes from reading on my phone. The books do not seem very expensive, and I am able to use it for my book club reading as well. The application allows you to take notes and bookmark pages too, which I did not know at first, but now that I do, it is on! If you have an iphone and like to read, you might check it out. Do you have a favorite application or tool on your phone? What is it? I've been hesitant to jump on board with the Kindle app because it just seems that it would be difficult to read on such a small device. How long did it take you to adjust? Since I own a digital book reader by Sony (international wireless wasn't available at the time for Kindle) I have completely converted to an e-book lover when I'm overseas. Do I need the Kindle app too? Am I really missing out!?! Please help! Oh, and I don't have an iphone, but I'm assuming the app is available for the ipod touch too. Okay well I might just have to give it a shot. I just LOVE my Reader and cannot even believe all of the time and energy that I wasted lugging books half-way around the world. I rarely use my ipod touch when I'm not traveling but it might be something fun to play with and have for a backup in case something terrible happened to my Reader! And am I dreaming...or did you mention that there is a Kindle app for Blackberry in the works? Now if that's true I will really be on board!